Ever wondered how Chinese women seem to defy the natural laws of aging? No, they don’t have any potions up their sleeve, they include generous amounts of an extremely healthy vegetable in their diet – the cabbage! Add this healthy vegetable to your diet and see how the benefits of cabbage work wonders for you. One of the best things about cabbage is that its not alien to any part of the world – it is grown and enjoyed as a delicacy almost everywhere. You may spot the vegetable in different shades of green, purple, or red (depending on where you are), but the benefits of cabbage are universal. Here are some of the top reasons why you should include cabbages in your diet. The Chinese maintain excellent health by reaping the benefits of cabbage through their diet. Six Benefits Of Cabbage For A Fitter You! This green leafy vegetable contains only 25 calories per 100 g of leaves, which makes it low-fat and full of nutrients. Cabbages are rich in phytochemicals like thiocyanates, zeaxanthin, indole-3-carbinol, lutein, sulforaphane, and isothiocyanates. These chemicals are known for their anti-oxidant properties and fight against cancer of the breast, colon, and the prostate gland. They also protect against heart disease and reduce the bad cholesterol or LDL levels in the blood. 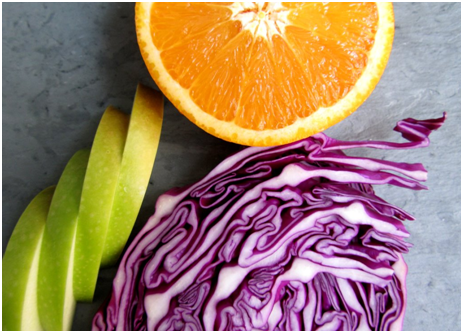 Did you know that cabbages consist of more Vitamin C than the well-known source, oranges? Cabbages provide 36.6 mg or about 61% of the Recommended Daily Amount (RDA) of Vitamin C. Vitamin C can fight common cold and cough, lower depression, heal wounds, reduce the wear and tear of the body, and help in the proper functioning of the nervous system. Cabbages are rich in Vitamin C, so increased resistance to common colds and coughs is one of the health benefits of cabbage. Cabbage not only has vitamin C, but also contains other vitamins such as pantothenic acid, pyridoxine, and thiamine. 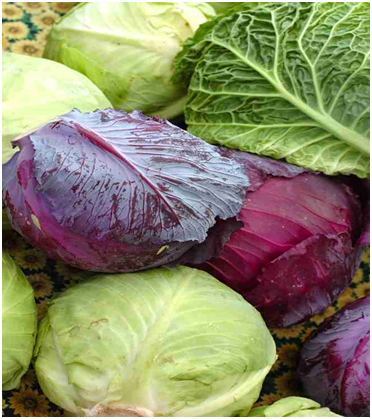 These vitamins are normally derived from external sources, and cabbage is one of the sources that’s rich in them. A cabbage provides 63% of the RDA levels of Vitamin K to the body. Vitamin K has been found to promote osteotropic activity in the bones and strengthen them. For this reason, cabbage consumption can make your bones healthier. Cabbages also help cure Alzheimer’s disease, as they limit neuronal damage in the brain. This is a very serious deficiency that is often neglected. Lack of roughage in the diet causes constipation, stomach ulcers, eczema, ageing, indigestion and the resultant loss of appetite, headaches, intestinal cancer, skin diseases, and various other related problems. As cabbage is high in fiber, it helps in retaining water and is a good cure for constipation. Cabbages also contain minerals like potassium, manganese, and magnesium in abundant amounts, so including them can supply your body with all these essential minerals that are required for the functioning of your body. You can enjoy these amazing benefits of cabbage by adding it to your diet. You can have it raw (in salads) or make a tasty dish out of it. If you’re too lazy to cook it yourself, just head to a place where you get authentic Chinese cuisine – after all, who doesn’t like Chinese food? This entry was posted in Nutrition and tagged cabbage benefits, health benefits of cabbage by Zipheal Editorial Staff. Bookmark the permalink.